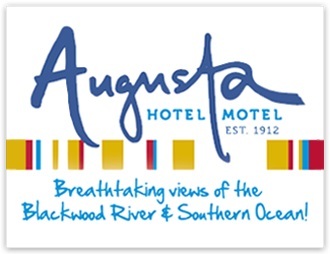 The Augusta Hotel has one of the best outlooks available in the region. Lovely meal once again here. There were nine of us there and everyone enjoyed their meal. Staff were friendly and helpful. Very comfortable, but old, hotel. Staff are very friendly and accommodating. Meals in the restaurant are excellent and good value. Lovely atmosphere as soon as you walk in the front door. Fantastic food and just a great location looking over the mouth of the river. Scrumptious food and big serves. Friendly efficient staff. Located on the main street in Augusta overlooking the Blackwood River. Located only 30 minutes south of Margaret River. A fee of $20.00 will be retained on all cancelled bookings. The balance will be refunded except as follows. If less than 72 hours notice of cancellation during off peak season and 7 days notice during peak season (school holidays public holidays and long weekends). Failing to give notice or non-arrival will attract a Penalty Fee equivalent to the total amount of the booking.